King Solomon wrote that "a threefold cord is not quickly broken." In the same way, these tri-color love knot earrings represent the strength that results when two people live in unity with each other and with their Creator. Although the three colors of 14K gold that interlock to form this pair are different, they combine to form a design that is a beautiful picture of love that's united and able to withstand any storm. With their versatile combination of white gold, yellow gold and rose gold, these earrings coordinate well with any jewelry collection and add class to any outfit. Earrings measure 10mm and have standard push back posts. 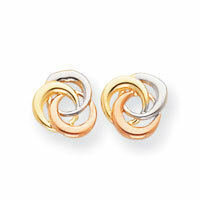 We guarantee our 14K Tri-Color Gold Love Knot Earrings to be high quality, authentic jewelry, as described above.